The "Nirmal Khora Village” project implemented by JanaJal in June 2016 has recently been awarded for outstanding Community Water Plants by Network 18 under Jaldaan. The award was given away at a function held at Hotel Trident, Nariman Point, Mumbai on March 24, 2017. Water has been one of the biggest problems in the colony for decades. With this project, JanaJal has demonstrated commendable skills by not only implementing it but also operating and maintaining the systems on 24 x 7 basis. The project, the first of its kind in Asia’s largest labour colony was the initiative of Gen VK Singh, Hon'ble MP Ghaziabad and MoS External Affairs, Government of India who also inaugurated the project himself in July 2016. It includes installation and operation of 5 community water plants that are providing safe drinking water at only 30 paisa per litre to the residents of Khora colony. Given the poor conditions of ground water in Khora, JanaJal is delivering safe drinking water compliant with global drinking water standards for quality and is committed to scaling up the project in Khora and further in Ghaziabad. Through its unique inclusive model, JanaJal has provided gainful employment to members of the Khora community who operate the systems on the day to day basis and are able to earn a sustainable livelihood. 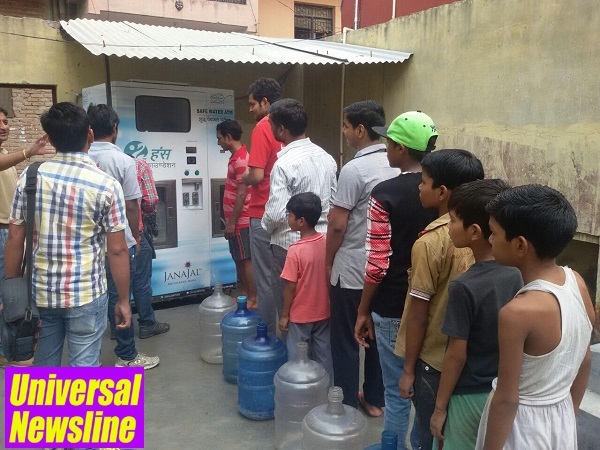 The company already has an agreement executed with GDA to build 33 safe drinking water kiosks in various public places in Ghaziabad. Initial surveys have already been completed and the company will commence installation in April 2017. With the summer season fast approaching, the residents of Ghaziabad are poised to get tremendous relief through this project. JanaJal has recently received investment from a US based social impact fund to the tune of USD 5 million and plans to install over 1000 systems by 2018. The company is based in New Delhi and has active operations in various cities and States in India. “We are deeply committed to making Right to Water a reality for every citizen of our country” said Parag Agarwal, Founder & CMD of JanaJal.